Brussels Sprouts may look like mini cabbages but there isn’t anything mini about the nutrients packed in these healthy vegetables. Brussels Sprouts are not only an exceptional source of protein, but they are also high in fiber and an excellent source of Vitamins C and K as well as iron, potassium and other vitamins, minerals and antioxidants. Because of their health benefits there is renewed interest in these small cabbage looking veggies. Over the years I’ve tweaked a variety of recipes to reduce or remove any oil I may have used. That’s been especially true in baking veggies. I used to use a little olive oil to bake brussel sprouts but now I just use water or vegetable broth. The same goes if I’m sauteing vegetables. 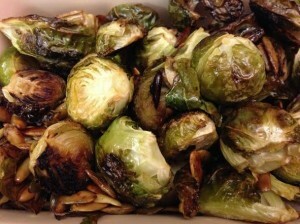 If you’re not yet a fan of brussel sprouts here are some suggestions to perk them up. Try roasting them with pumpkin seeds. (My personal favorite) Or use walnuts for added Omega 3’s. Splash them with a little vegetable broth instead of oil for baking. For a sweeter version, especially around the holidays, add a bit of maple syrup. Never overlook the flavor enhancing properties of balsamic vinegar which can be splashed on after baking. Check out the recipe below as a guide but don’t be afraid to use your imagination and create your own! Cut the Brussels Sprouts in half and place in a bowl with the pumpkin seeds or walnuts. Mix the vegetable broth, maple syrup, if using, and salt and pepper together. Pour over the Brussels Sprouts and stir well to mix. Line a baking sheet with parchment paper and spread brussel sprouts on sheet in single layer. Roast for 30 mins in a 400 degree oven. Serve as is or if you want sprinkle a little balsamic vinegar to taste. I hope this helps you to Eat More Plants!